This Ancient Egyptian Interactive Notebook is divided into 11 lessons starting with the geography of Ancient Egypt. It then continues through the governments and dynasties of Ancient Egypt, the social life of what it was like to live in the time of Ancient Egypt, and includes lessons on hieroglyphics, religion, burial rituals, and the wonderful landmarks constructed by the Egyptians. It concludes with some review games, a study guide and an exam. Each section takes 1-6 days to cover, making this a comprehensive unit which includes multiple foldable activities, readings, cloze notes, time lines, and lots of opportunities for writing and creative expression. In this zipped file you will receive 4 PDFs. The Ancient Egypt book is 175 pages. The Egypt Geography file is 10 pages. Ancient Egypt Bingo is 84 pages. The PowerPoint slide show on Burial Rituals of Ancient Egyptians is 15 slides long. That makes a total of 284 pages covering Ancient Egypt. 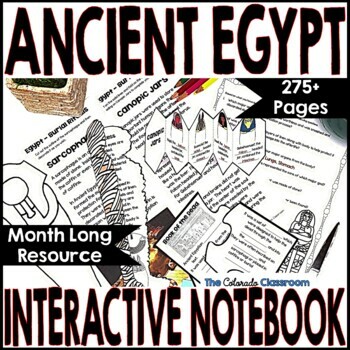 Included in this Ancient Egyptian Interactive Notebook are lesson plan suggestions, full color examples, multiple foldable products, readings, engaging activities, a unit test, a study guide, and 2 different review games to play before the big wrap up. 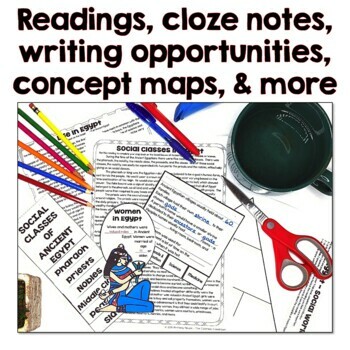 Lesson 1: Geography of Ancient Egypt includes a map, cloze notes, 2-column notes, and a study guide with an exam. Lesson 2: Ancient Egypt Vocabulary includes 6 vocabulary strategies, a list of vocabulary words and definitions, flashcards, a crossword and word search, and an exam. Lesson 3: Ancient Egypt Time Line includes a foldable time line with a pocket to store it in. Lesson 4: Governments in Ancient Egypt includes 2 foldable activities and a writing reflection piece with an illustration. Lesson 5: Ancient Egyptian Dynasties includes a group of 33 foldable dynasty focus pieces and a concept map to pick the 5 most important dynasties from the Ancient Egyptian realm. Lesson 6: The Social Life section includes a step book foldable on the social classes within Ancient Egypt. It also includes a foldable activity on women and a 4-tab book on villages, education, science, and medicine. There are two readings, and a 3-2-1 review activity that also accompany this lesson. 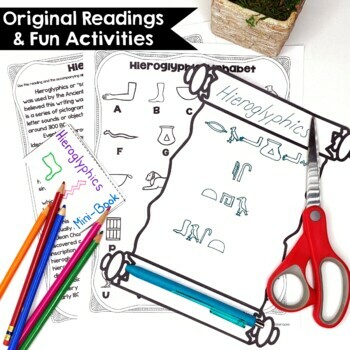 Lesson 7: Hieroglyphics includes a reading on hieroglyphics, including an alphabet page, a foldable activity, and a creative expressions activity. Lesson 8: Religions features 3 foldable activities, a fact sheet on some of the major gods of Ancient Egypt, and a picture frame activity. Lesson 9: Burial Rituals includes 4 foldable activities, two of which include readings, a creative expressions activity, and comprehension questions to review the learning at the end of the lesson. This lesson also includes a supplemental PDF slide show to help with the teaching of this material. 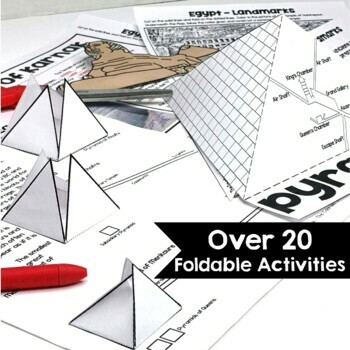 Lesson 10: Landmarks of Ancient Egypt has six foldable activities, an outlining activity, interactive notes, and a writing reflection piece. Lesson 11: Assessments includes a review game of dominoes, a review game of Bingo, a study guide, and an exam.